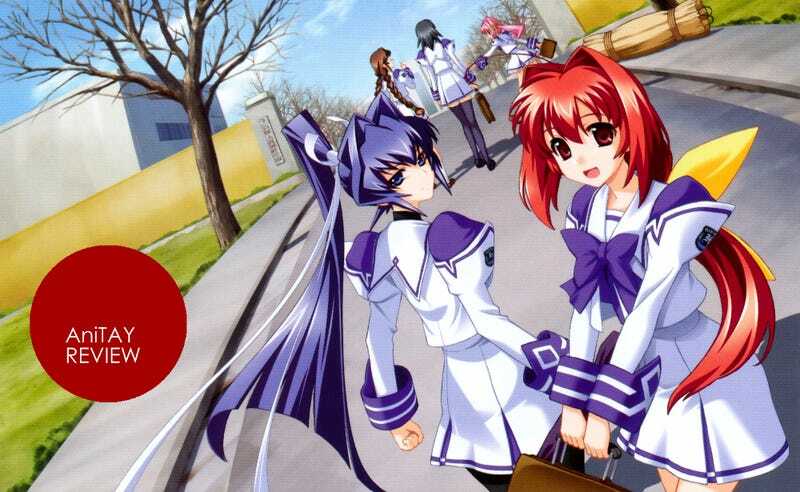 Today I’m reviewing Muv-Luv, a visual novel developed by âge. On the surface, this game is a slice-of-life romantic comedy and it makes no excuses for itself. Under the hood though, this game is really something entirely different, and it’s very aware of this. Update 7/13: You can now purchase Muv-Luv (which includes the first two parts of the trilogy) on Steam right here. Alright, you need to know two things before we start this review. The first part is indeed a slice-of-life romantic comedy, but some people may fail to realize that there are two parts to this game. The first part (Muv-Luv Extra) is unlocked at the game start and you can play it through normally. The second part (Muv-Luv Unlimited) is unlocked after you complete the main two routes of Extra. Both of these parts are very different, it is so different that I nearly separated this game review into two parts. They are entirely different in so many ways that’s almost impossible to review them side-by-side. By pop culture osmosis, almost anyone that has heard of Muv-Luv already knows at least part of the strange, game-changing twist that makes the second part possible. If you don’t already know about it, I’m sorry, but you just have to skip to at least “Not Bad” right now because I’m about to spoil the twist in the “Fantastic!” section. I can’t write this review without spoiling it, it’s just not possible. Spoilers here for Unlimited, I’m warning you. So, on the surface, Extra was a straight up romantic comedy slice-of-life. Cool! Muv-Luv Unlimited throws Takeru onto an alternate Earth where only about one billion people are still alive due to the appearance of an extraterrestrial life form known as BETA. They’ve destroyed most of humanity and those that are left are defended by soldiers across the globe using giant mecha called TSFs (Tactical Surface Fighters). As your fun fact of the day, Attack on Titan was apparently inspired in part by the Muv-Luv universe. The similarities aren’t exactly hidden either, they are pretty similar in terms of setting with the main difference being technology. The entire Unlimited arc hints at the idea that Takeru has crossed into an alternate reality. Not only that, but he’s experiencing flashbacks (or flash-sideways?) of the many routes you can take in Extra. Basically, the game is implying that every route you took in Extra and Unlimited actually is happening, it just isn’t happening to this specific Takeru. In effect, the game has gone meta on you by acknowledging the existence of every possible route. That’s pretty damn awesome actually, it’s an brilliant example of blurring the lines between story and gameplay. It’s an intriguing twist for a game that sorely needed something intriguing. The majority of this game is pretty forgettable, but there’s a sudden and almost weird uptick in quality at the end. Speaking in actual quantity, the spike wasn’t very significant, but compared to the rest of the game? It was huge! If nothing else from this game, I’ll remember the final arc. Generally speaking, the fish-out-of-water plot of Muv-Luv Unlimited isn’t terrible, nor is it good. It tends to just fluctuate a lot around Not Bad. It is pretty unoriginal in most ways and it doesn’t have much to stand on. It quickly falls prey to “harem antics” once again like Extra before it. At least it can stand on the world building they introduce. This cast honestly is all over the board. Some are good, some are bad. Some are tropes, some are mostly tropes. This swerving is not helped by the fact that both parts of the game are so different. I honestly could analyze this cast for a while and pick out the good and the bad, but that would take a long time. It’s a roller coaster ride of quality. I’ll just settle for sticking the whole lot in here and be done with it. Of course, the protagonist is one example of a negative. He has the tendency to grab hold of an idiot ball the size of Mercury and he just refuses to let go. It was sad to watch sometimes, though that’s somewhat forgivable since I might be a bit harsh on him. I have no idea how I would act in his position. The slice-of-life romantic comedy of the first part (Extra) is completely forgettable. There is nothing very interesting to it. The characters, while sometimes good, are not enough to carry the plot. Basically the only reason you play through Extra is to unlock Unlimited: the better of the two parts. Extra is basically only notable for setting up the main character for Unlimited and introducing the characters. The plot beyond that is pretty terrible. The entirety of the game banks really hard on the female cast. They’re all ridiculously young and all the usual anime/manga/visual novel moe tropes are in complete effect here. They are walking tropes and everything that happens to the main character is predictable. The plot is very much what you expect it to be and there’s really nothing to see here. Let me tell you something right now: That card is not quite right. It won’t be worth the time of anyone in this for just one game. If you want to just play Muv-Luv and call it quits, you will hate this game. It’s not that good on its own. I have since reviewed the second visual novel in the series. Let me make it clear that this is my favorite science fiction franchise to date. If you have any interest in storytelling or science fiction, then you should consider playing both this and Alternative. It’s really quite something. Of course, that’s where the card isn’t quite right. If you want to go on and play the sequel, Muv-Luv Alternative, after this game, then the card instantly becomes a “GO FOR IT”. This game is a paradox. As a standalone game, it’s pretty bad. Maybe even terrible. As a piece of the Muv-Luv saga though? It is completely indispensable and it forms a critical part of the narrative. Without it, Alternative couldn’t be as excellent as it is. I’m not sure I’ve encountered such a massive paradox in my life, it’s baffling and I had to rewrite this conclusion multiple times to try to convey this adequately. As a standalone game, the plot is pretty paper-thin (particularly in Extra) and the characters are fluctuating all across the quality scale. Unlimited manages to differentiate itself in the last hour or so when the quality takes a turn for the better, but this wasn’t quite enough to save the game for the average player. There’s too much moe, fanservice, and weirdness to overcome in such a short time. So, I reiterate once again: I think that Muv-Luv is a bad standalone game, but the Muv-Luv saga is actually proving to be one of the strongest franchises I’ve ever seen with the addition of Alternative. This review was originally created with Talk Amongst Yourselves’ official review format. It was later modified and reedited into Ani-TAY’s official review format in September 2015. You can now purchase Muv-Luv (which includes the first two parts of the trilogy) on Steam right here.